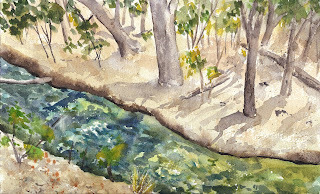 I've kept up with my plan to paint en plein air once a week. On Sunday, July 5th, we drove down to Anderson Lake County Park in Morgan Hill. It was awfully dry-no green undergrowth in the woods or grasses in the open areas-just dirt. The creek was full, however. They likely let more water out of the reservoir for the holiday weekend; we saw lots of picnicing families. I had a real problem capturing the rushing water-there were a few little rapids and lots of sparkles on the water. Without resorting to mask I just don't know how to interpret the movement and light on the creek. Really Beautiful! Love the colors you've chosen. The shading and spattering are wonderful. So glad you are keeping up with your plein air. Janice thanks for joining my site and I am joining yours. Nice work. I think you did well on the water without mask -- I had no problem knowing it was a creek. Interesting perspective from above, too! Janice, this is REALLY nice, I love the perspective and the how you've captured the light. The colors in the water are very pretty and I do think you've captured the moving water quite nicely. Thanks for sharing!